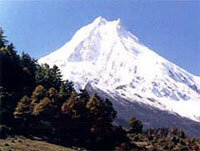 Manaslu used to be a restricted trekking area , only from December 2007 that it is allowed for general trekkers. The Manaslu trekking takes us to the upper Budhi Gandaki of Gorkha district , also called Nupri in Tibetan. The region borders with Tibet, the people have active trading with the Tibetans and they are themselves descendants of Tibetans. Their speech, clothing and cultureare same as that of Tibetans. Manaslu trekking offers preserved, authentic villages, invaluable old monasteries, Tibetan Buddhist culture and superb mountain views. This trip is both a Himalayan trek and a cultural journey to medieval world. The Manaslu trekking starts with a five hour drive to Arughat and the trail follows the valley of thundering Budhi Gandaki river. Passing through numerous waterfalls and enjoying the alpine scenery, we reach the exotic Buddhist villages of Sirdibas and Samagaon. These villages offer an otherworldly , exotic atmosphere and are a great place to watch authentic Buddhist arts. The mountain views in Nupri are sensational and the Larke pass (5,213m) is a dramatic Himalayan pass to cross. Crossing the Larke pass we emerge to Marshyangdi valley on the popular Annapurna circuit trek. Our trek ends at Beshisahar where we catch our vehicle back to Kathmandu. Day 01: Arrival in Kathmandu, transfer to the hotel. Day 03: Drive to Arughat-500m (6 hr). Day 04: Trek to - Arkhet-650m ( 5-6 hr). Day 05: Trek to - Labu Bensi-700m (6-7 hr). Day 06: Trek to - Tatopani-800m (5-6 hr). Day 08: Trek to - Ngyak-1550m (6-7 hr). Day 09: Trek to - Namru-2450m (6-7 hr). Day 10: Trek to - Lho Gaon-3000m (5-6 hr). Day 11: Trek to - Sama Gaon-3450m (5-6 hr). Day 12: Trek to - Samdo-3900m (4-5 hr). Day 14: Samdo - Larke Bazar-4150m (4-5 hr). Day 16: Bhimathang- Karche-2550m (5-6 hr). Day 17: Karche- Dharapani-1943m (6-7 hr). Day 18: Dharapani- Jagat-1314m (6-7 hr). Day 22: Free day in Kathmandu.Farewell Nepali dinner with ethnic cultural show.